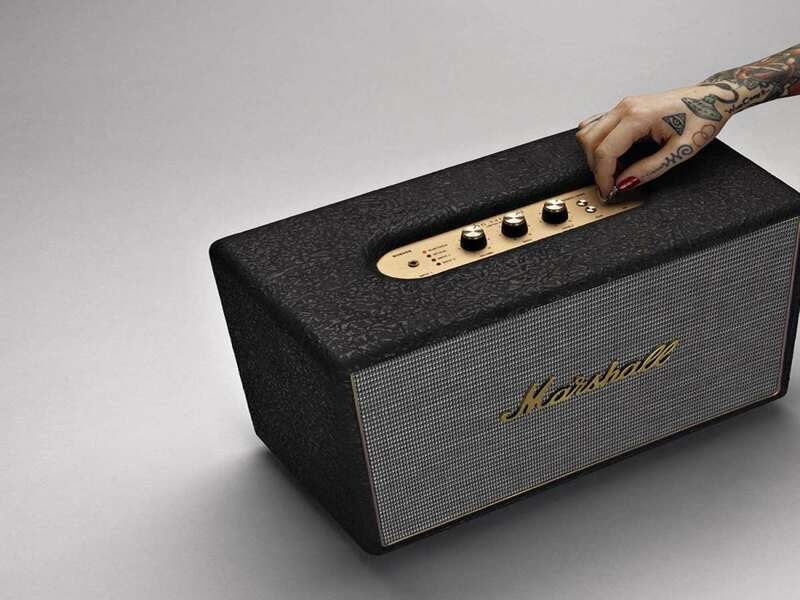 Aside from the addition of his name in 2 locations, I'm not sure what makes Marshall's Woburn Bluetooth speaker by John Varvatos better than the original Marshall Woburn Bluetooth speaker. I'm also not sure what qualifies John Varvatos, a men's clothing designer, to custom makeover a speaker. But I guess we're going to find out. According to Marshall, this collaboration "unites old world craftsmanship and refined tailoring with a rock 'n' roll sensibility." That means leather and metal. The Varvatos Woburn is wrapped in black, full-grain Italian calfskin that's been washed and heat stamped to create the crinkled, distressed look of rockers you cannot even believe are still alive, much less still performing, such as The Rolling Stones and Alice Cooper an iconic representation of an genre that only gets better as it weathers the decades. 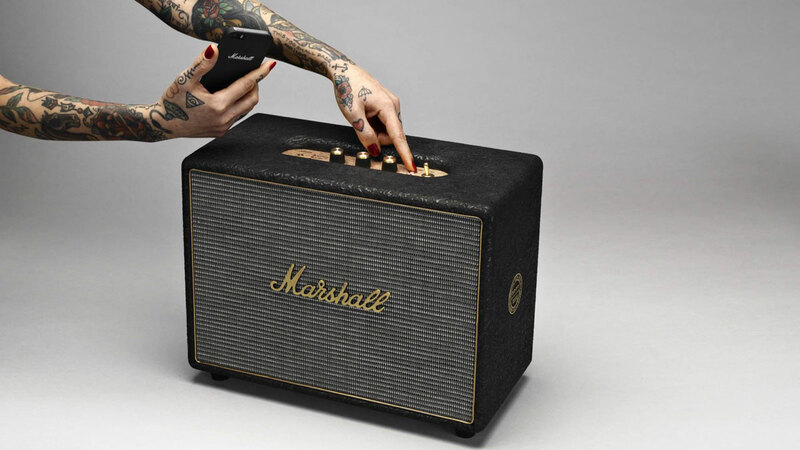 The Marshall logo on the front of the speaker is then cut in an antique brass, as is the side insignia indicating which in the 300-piece series of Varvatos you've scored. 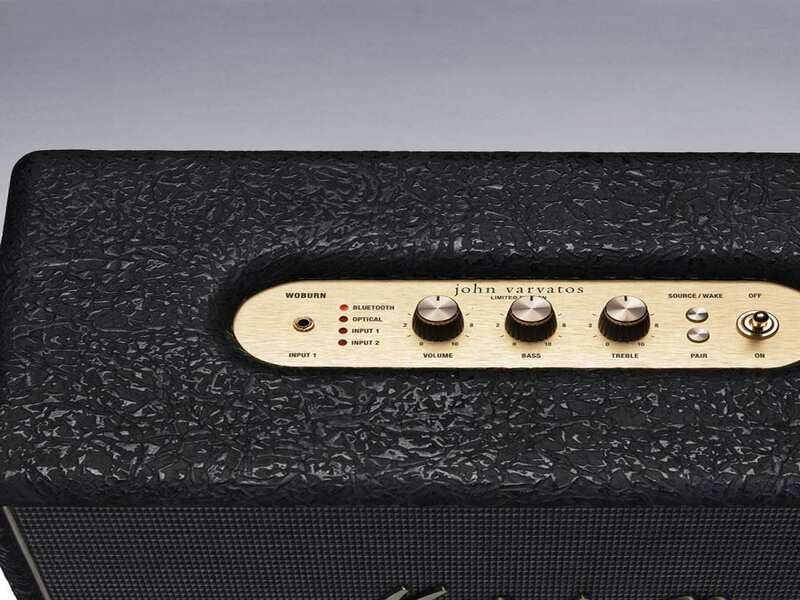 Acoustically, the Woburn has been designed true to the Marshall name: "with loud in mind." Analogue, treble, and bass volume knobs give listeners the sound reins, and the speaker also comes with an optical input port for hooking it up to a TV, Apple TV, Airport Express, hard disk player, streaming player, or satellite/cable receiver. RCA input ports encourage the occasional stroll down memory lane with Marshall-style blasting of your old CD player or turntable.